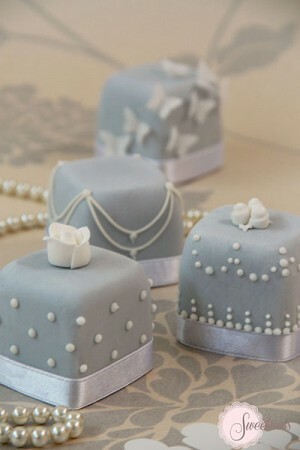 Mini cakes are individual servings of cake which can make a beautiful treat for your guests. Mini cakes come in various shapes and sizes and can be decorated to match your main cutting cake or wedding theme. Mini cake towers are a stunning centre piece in wedding receptions. With mini cakes you have the option of choosing various flavours so your guests will be spoilt for choice. You can also serve the cakes immediately after cutting your main cake as they are already in individually sized portions which removes the time it takes for the kitchen to portion the cake for serving. 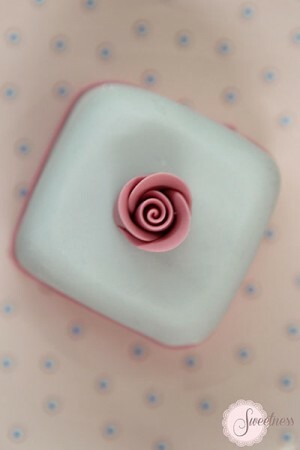 Mini cakes make lovely favours for your wedding guests when individually boxed. They are a gorgeous gift for your guests to take home if you are not serving them on your wedding day. Classic victoria – Madagascan vanilla sponge soaked in vanilla bean syrup, layered with raspberry conserve and vanilla bean buttercream. Zesty lemon – Lemon sponge soaked in lemon syrup, layered with lemon buttercream and home made lemon curd. Dark chocolate truffle – Belgian chocolate sponge layered with dark chocolate ganache and chocolate buttercream. Luxury fruit cake – Traditional, rich, cognac soaked fruit cake. Espresso coffee and walnut – Coffee and walnut sponge soaked in espresso syrup and layered with double espresso buttercream. We also offer a wrapping service for mini cakes and can have them individually boxed and tied with ribbon for you to give as favours to your guests. Please have a look at our Mini Cakes London page to see our portfolio of mini cakes. Please enquire if you would like a bespoke design made especially for your big day! In the past most people had traditional fruit cake as their wedding cake flavour of choice. Today however there are endless choices of flavours and fillings to choose from and making a decision can sometimes be very difficult as we are so spoilt for choice. Here are my top tips to help you when choosing your wedding cake flavours and fillings. When are you serving your wedding cake? It’s recommended that you have a tasting consultation with your cake designer. I offer six different sample flavours and fillings at my cake consultation sessions which can then be tweaked if need be to suit the couples tastes. 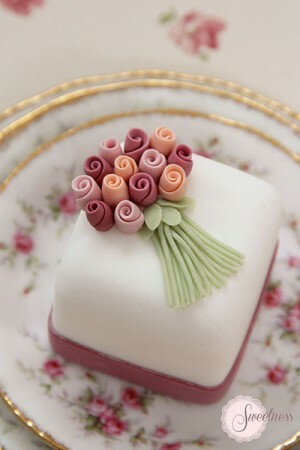 You should have a good idea of your wedding menu before hand as the wedding cake flavours should complement your menu. If you are serving the cake as dessert after a very heavy meal for example it would be preferable to serve a light, refreshing sponge such as lemon or carrot. If you opt to serve the cake buffet style during the dancing you can opt for heavier, richer flavours such as chocolate or fruit cake. This works well as people can help themselves to bite sized portions during the entertainment and sweeter, richer desserts are preferable at this time of the night. Of course, you can have the cake individually boxed and given away as favours. In this case you can choose any flavours you like but be sure to advise your guests when it is best eaten as a slice of sponge will not stay fresh for as long as a slice of fruit cake. The wedding venue can have an impact on your choice of wedding cake flavours. A light, lemon sponge is best suited to an outdoor wedding on a hot summers’ day. If you are have a traditional church wedding you may opt for a traditional flavour such as fruit cake. Your wedding cake fillings will depend on the cake flavours you have chosen. The fillings should complement and enhance the flavour of your cake. The fillings can also be used to adapt the flavours to suit your tastes. Carrot cake for example can be made sweeter with vanilla buttercream or zesty with a lemon buttercream. A chocolate sponge can be made richer and more decadent with a chocolate ganache or lighter with a chocolate buttercream. Curds and preserves can also be used to enhance the flavours of your sponge. Lemon curd will enhance the tangy flavours of a lemon sponge while raspberry jam will be reminiscent of home baking when paired with a vanilla sponge. Avoid fresh cream fillings for summer weddings as these may go off in the heat. Instead, opt for fresh flavoured buttercream fillings which will endure. With the endless options available today most couples choose a different flavour for each tier of their wedding cake which provides much more choice for their guests. If you are choosing exotic flavours that may not suit everyone tastes use them for the smaller tiers and have the more popular flavours as your larger tiers. At the end of the day choose flavours that you love as it is your wedding cake and you should enjoy it on your big day! Please visit our wedding cake fillings and flavours page to view our menu. Sweetness Cake Boutique provides wedding cakes in London and Greater London. Please enquire if you would like to book a cake consultation. Manor weddings are full of pomp and tradition. English Manors are situated in beautiful, impeccably manicured grounds and create a beautiful backdrop for the ceremony and photos of the day. The rooms are often lavishly furnished with antiques and beautiful fabrics and trimmings. When choosing a wedding cake for a Manor Wedding a Traditional Wedding Cake is best. A cake that incorporates a lot of detail so that it doesn’t get swallowed up by it’s lavish surroundings and is a centerpiece on its own. 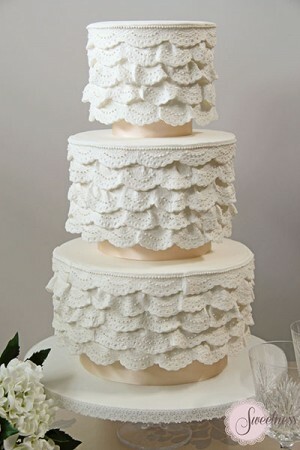 I love lace wedding cakes for traditional weddings. They are the embodiment of Victorian decadence and elegance and can hold their own in a Manor House setting. It is especially beautiful when the bride wears lace and that design can be incorporated into the wedding cake. I designed the Lace Cascade Wedding Cake with Traditional weddings in mind. It’s all about the ruffles and lace! Please have a look at our Wedding Cakes Page to have a look at our portfolio. Please contact us if you would like to book a cake tasting and consultation at our London Cake Boutique.